Because Healthy is beautiful and oh-so simple. Want to lose weight? And, more importantly, stay slim? Healthy Ways knows how, and they can’t wait to share the secret with you how to delete depression …..
Every person who’s ever tried to lose a few kilograms knows the seduction of a crash diet. But have any of us ever had long-term success with a fad diet? No. Because the simple truth is, if you don’t eat correctly, the kilos will either stay put or relentlessly creep back on! 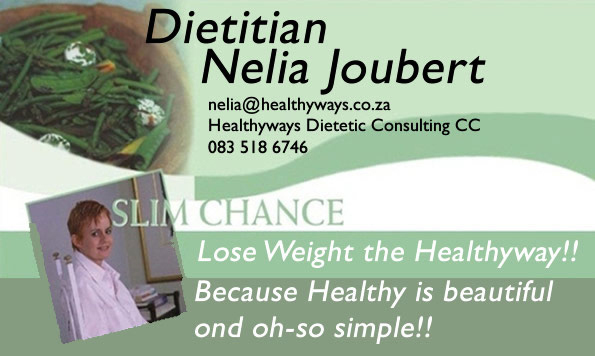 There is only one way to lose weight and keep it off: Eat correctly every day and make it a way of life. Crash diets will only slow down your metabolism and are potentially damaging to both body and state of mind. There are no mass ‘do’s and don’ts’ lists, no ‘one-fits-all’ eating plans and ‘must and must-not’s. Follow the Low GI method, with the correct balance of carbohydrates, protein and fat, Healthy Ways makes losing weight easy with an individualized eating plan designed by a dietician to speed up your metabolism, feed your cells properly, and ensure that all hormones are working to keep you free of depression , … at your recommended weight !